She is reading a book and smoking a cigarette as she drags herself to work. Her mind in one world; her body in another. One big blur. That was my yesterday. A day consumed by meetings. Important meetings, but never the less, the killer of getting things done. How to be Free kept me busy on my train journeys. Tom’s style is to rant. He rants against a system he perceives as oppressive and detrimentally to our ability to live free of the consumer society we find ourselves drowning in day to day. I like the ideas in the book, which should help me put up with the ‘rant against the system’ style in which the book is written. I’ll write a complete review later once I finish the book. A new day, another train ride down to London. I was in an optimistic mood this morning. It felt like I had turned a corner and ahead of me the horizon and wide open possibilities for the future. It is exciting. My book about Pythagorean numerology arrived yesterday. It is written by Glynis McCants, a former stand-up comic and writer. I have dabbled in numerology in the past. I am not sure what has guided me back here, but it fits in with the project I am working on at present. I figured out my Life Path number which is the most important number in the series of numbers that are meant to affect our lives. My Life Path number is 3. Three’s are creatives. I must admit that the description of a 3 Life Path seems uncannily accurate. McCant’s description of a 3 person confirmed what I already knew about myself, which is what some would say makes subjects like numerology and astrology believable because people project themselves into the words, which reflect what you already believe to be true about yourself. I guess it doesn’t matter whether it’s true or not. It only matters if you believe it to be true and find the words helpful in your own personal reflection. I tend to evaluate these things on whether they are useful or not useful. If it’s useful, use it; if not, discard it. In this case, the words are useful and that is enough for me. Joy, the trolly lady, has stopped speaking to me. I used to buy my coffee from the stand on the platform and the occasional bacon roll from Joy. She gave me a lecture once about how I could save money by buying my coffee and my bacon roll from her. So I did. However, her coffee is not that greatest, plus I was spending a fortune buying coffees. So I decided to make my own coffee and bring it in a thermos. Joy didn’t like this one bit. The first time I brought my own coffee, she gave me a dirty look. The second time she decided she’d flog me the bacon roll anyway. Mostly I say no thanks. But she asks every day. Last Friday I asked her for a bacon roll and she said sorry I don’t have any. Call me paranoid, but I got the feeling she had some bacon rolls, but she wanted to make sure she offered them to her regular customers first. Fair enough, I guess. Monday, I brought my own bacon roll and coffee onboard. And now Joy has fallen out with me completely. Today I didn’t have a coffee or a bacon with me and Joy wasn’t compelled to offer to sell me either. She just looked at me, squinted, and kept on pushing her trolley right past me. The rest of my day passed without incident. Things were quiet on the work front. The kind of quiet that precedes a storm. These next few weeks will be critical. At lunch, I decided to wander down streets I had never been, in search of a new place to eat. There were plenty of choices. I settled on a little joint called the Snaxx Cafe. Nothing fancy. The prices were much the same as any place else in London. It was quiet, clean, and had a good view so I decided to stay and enjoy a bacon and egg sandwich. I am still fighting though a cold I picked up from sitting in iceboxes all day. It boggles my mind that on the train and in the office I work that the air condition is blowing full blast as if it were hot outside. Even stranger, when asked to if the air can be turned off, the reply is “We can’t. There is a summer setting and a winter setting and we can’t turn the air conditioning off until late September.” OK. I decide to burn the cold out off me by sitting in the steam room and the sauna after work. I find extreme heat often cures me. We’ll see. life is an adventure on paper, but is it in reality? All life is technically an adventure, a bold, usually risky, undertaking with uncertain outcomes. However, because most of us live in expectation that everything should turn out just as we want it to, life becomes oddly a function of habit where we live in the immediate future or past, but rarely ever the present. I notice it in myself. I drive the same route to work in the morning, my expectation being that today’s drive should more or less resemble yesterday’s drive. When something happens that upsets that expectation, an accident, a slow tractor hogging the rode, the immediate reaction is to get annoyed or angry. I take the same train, sit in the same carriage, generally sit in the same seat if no one has beaten me to it. I walk the same route to the office, stop at the same coffee shop, order the same drink (in fact, I do this so habitually that the staff don’t even asked what I want to drink anymore, they automatically start preparing my medium black coffee to go). Here is were the past creeps in. Because it happened that way yesterday, and the day before that and the day before that, we automatically presumes the same thing will happen again today. But in reality the outcome is uncertain. However, we presume it to be certain and get upset when it doesn’t turn out just as we want it. In an adventure, the uncertainty of the outcome is what makes it exciting. Imagine what life would be like if we embraced the uncertainty of life from moment to moment. I wonder if we slip into presumptions and habits of routine because we cannot take too much excitement? Or do we need to feel certain, even if it is a false certainty just so we can function? Or is it that we can’t break the cycle of our mind either being in the future or the past from one moment to the next? I thought might be time to get back into sketching…great for relaxing and focuses the mind. 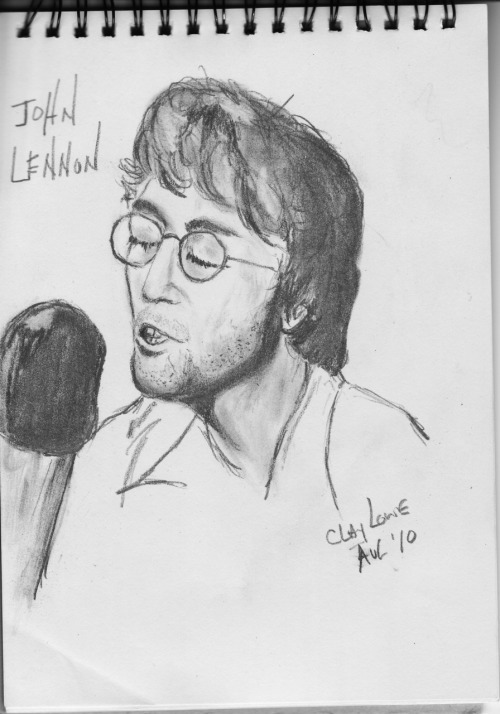 I sketched this picture of Jonh Lennon on my way home from London late last night.